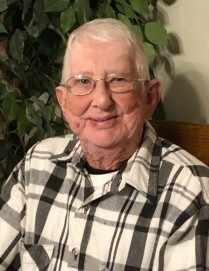 Philip F. Hoban, Jr. 82, of Berlin, MA, passed away peacefully on Friday, April 5, 2019, at his home, surrounded by his loving family. He is reunited in heaven with his beloved wife of thirty-eight years, M. Eunice (Spinney) Hoban, who predeceased him in 2015. Philip was born on September 26, 1936, a son of the late Philip F. and Hilda F. (Collins) Hoban. He was raised in Hudson, MA, where he graduated from High School. Philip honorably served his Nation in the United States Army National Guard following graduation and eventually settled in Berlin after marrying the love of his life M. Eunice (Spinney) Hoban. Philip had a long and productive career as a Police Dispatcher for the Town of Stow, before eventually retiring. Philip was a fun-loving person, with a quick-wit and great sense of humor. He also enjoyed golfing, traveling and dining. Philip was a classic car enthusiast and was a regular at the local car shows and Friday night classic car gatherings at Kimball’s in Lancaster. Amongst his many heartbroken survivors he leaves his stepson, Mark S. Andre and his wife Patricia of Clinton, MA; 4 grandchildren, Nicole Andre, Timothy Andre, Steven Andre and Jennifer Davis; 9 great-grandchildren; and his beloved nieces and nephew. In addition to his parents and his wife M. Eunice (Spinney) Hoban, he was also predeceased by his brother, Earl Hoban and sister, June Perillo. Relatives and friends are invited to a period of calling hours from 9 am until 11 an on Monday, April 8, 2019, at TIGHE HAMILTON REGIONAL FUNERAL HOME, 50 Central St., Hudson, MA; immediately followed by a funeral service in the funeral home at 11 am. Interment will be in Forestvale Cemetery in Hudson, MA. Flowers or memorial donations can be made in Philip’s name to the: Wounded Warrior Project, PO Box 758517, Topeka, Kansas 66675-8517; www.woundedwarriorproject.org.